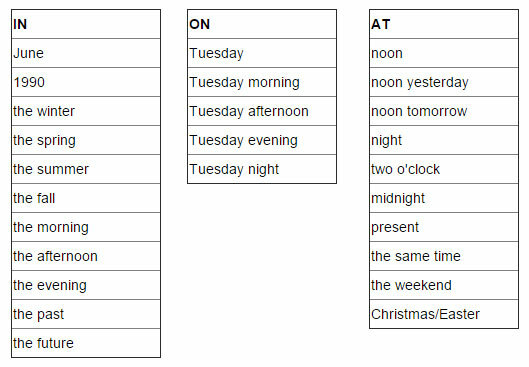 *On is frequently omitted before the expressions Thuesday morning, Thuesday afternoon, etc. I saw her on Xmas day. He started work on Monday. *In some varieties of English people say on the weekend and on Christmas. She often goes out at night. I have a meeting at 10am. I don't usually work at the weekend. I stay with my family at Christmas. at a time: He went down the steps two at a time. at last: At last, they found the answer to the question. at times: At times, she enjoys a good historical novel. in case of: In case of rain, the people will stay at home. in the beginning In the beginning, they didn't understand English. in the end: In the end, the two policemen caught the thief. in time for: I came in time for the second half of the movie. on occasion: On occasion, I enjoy a good television program. on time: He almost always gets to work on time. on the spur of the moment: We decided on the spur of the moment.